If a measurement that you need does not exists, you can either leave the Measurement field blank and add this into the Item field, or if you're a developer, there is a filter that allows you to add more (or remove) measurements to this dropdown field. See the Developer Docs for more information. To continue adding more ingredients, you can either click the Add Ingredient button, or simply use the TAB key while editing in the last Item field, and it will automatically create a new ingredient row for you, ready for you to enter in the amount. Helpful, right? You can also add section headings to group your ingredients into separate sections. Just use the Add Section Heading button to create these. 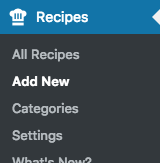 If you need to move your ingredients or section headings around, simply click the grabber icon to the left of the row and drag it where you need it. Each direction needs to have content, using the big field to the right. You can also add an image to each direction. Just click the Add Image button, or click on the dashed empty square to load up the WordPress Media Library tool that will allow you to upload a new image or choose from your library. To continue adding more directions, just click the Add Direction button and a new, blank row will appear. You can also add section headings to group your directions into separate sections. Just use the Add Section Heading button to create these. If you need to move your directions or section headings around, simply click the grabber icon at the top left of the row and drag it where you need it. 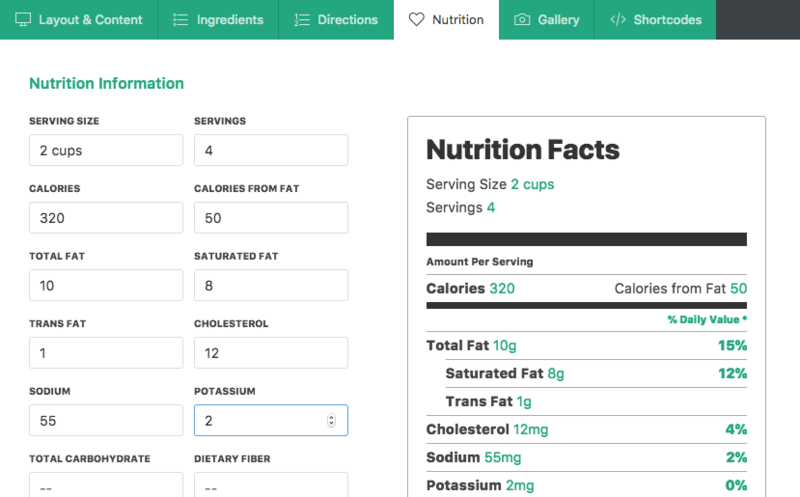 Cooked comes with a very powerful Nutrition Facts feature. This allows you to add nutrition facts and display them just like the labels you see on products in the store. Head over to the Nutrition tab and start entering the information, and the label will display them. 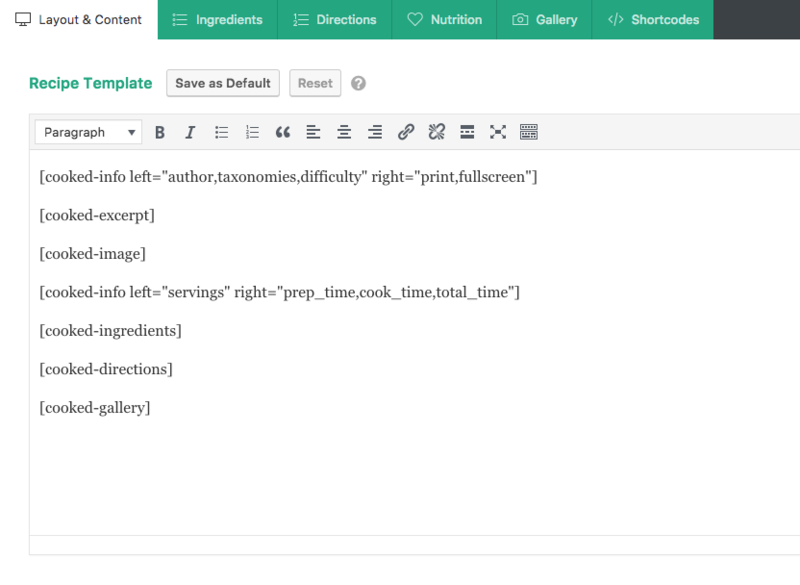 You can either use the recipe shortcode to display this information, or you can use the Cooked widget to display this in the sidebar of your recipe template (if your current theme supports it). By default the gallery type is simply a Cooked Gallery. This is an included gallery type that allows you to add images and a single video (if needed) to a mobile friendly gallery that you can display anywhere on your recipe template. To create Cooked Gallery items, simply click the Add to Gallery button, which will trigger the WordPress Media Library, allowing you to upload an image or choose one from the library. You can edit the Title for each image, which will add that as a caption in the gallery. If you need to move the images around, simply drag & drop them. To add a video to the beginning of your gallery, paste in a valid Youtube, Vimeo, etc. link into the field above the images. This video field is not supported when using any of the third-party plugins. If you're using one of those, you will need to use their available features to add video to your galleries. All of the available recipe template shortcodes are explained in more detail on the Template Shortcodes document.